Ahoy, matey! 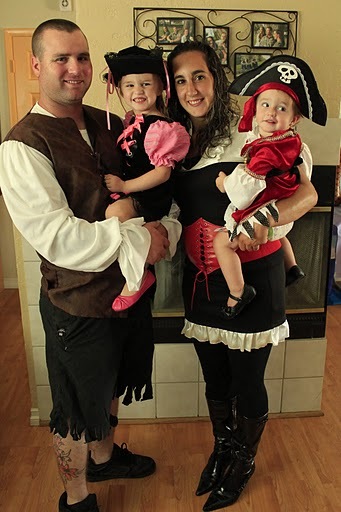 Avast ye! 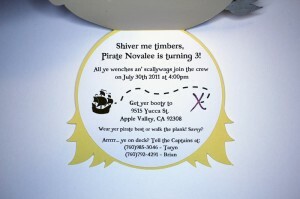 Come take a gander at me new pirate invitations! Hold on to your booty because these invites are too cute to handle! 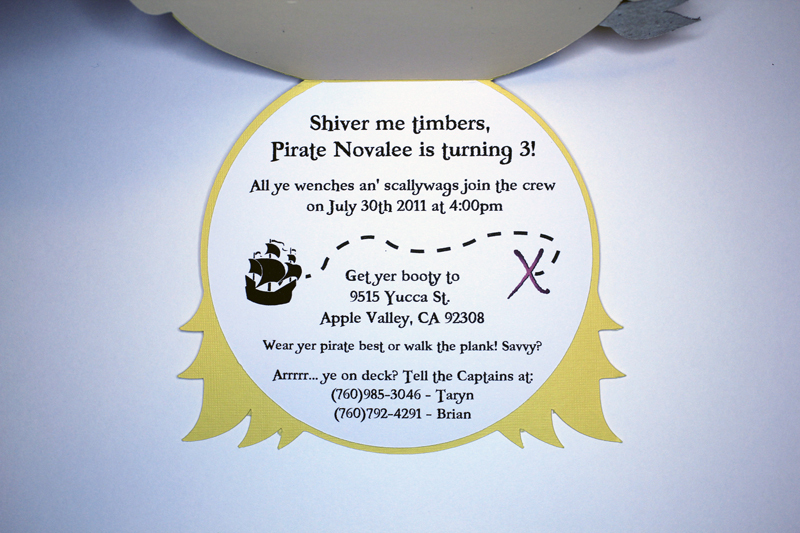 Are you sick of the same old red and black boy pirate invitations? Do you need something a little more cute for your little girl buccaneer? Well, I have the answer to all your problems! I designed these especially for my little niece, Novalee Paige, who is turning 3 at the end of July. 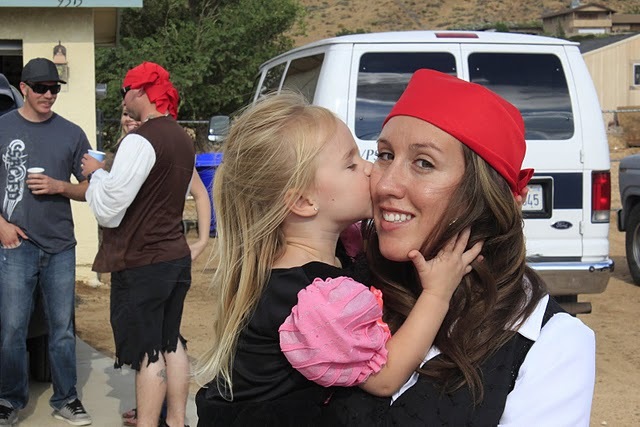 She really wanted a pirate theme birthday bash, so I came up with a pirate girl invitation to look like her. Sooo do you scallywags and wenches want to know how to create these invites or what? These were a bit time consuming but totally worth it! 1) Paper for the flesh and hair, black for the outline and inside of the eyes/eyelashes(this is 1 piece in the svg), white for the eyes and a different color for the iris, paper for the scarf (2 different colors if you want the polka dot look or 1 if you want a different look/design), small gold link hoops (found in the jewelry section at Michael’s) for the earrings, paper for the eye patch and ribbon to connect to the eye patch, glue, pop up adhesives for the nose. 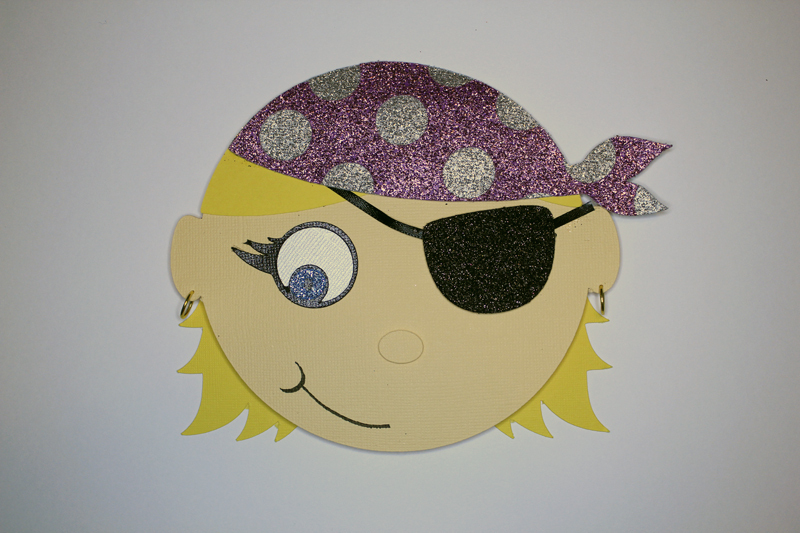 2)I personally used glitter paper on the scarf, eye patch and eyes to make it more fun, but that’s all up to you. A lot of people don’t like to use glitter paper in their Cricut, but you can always bling up your paper with glitter that spreads on or buy paper that is embellished. 1) It’s quite simple after you cut out all your pieces on your Cricut. Just score the hair so you can fold it, glue the forehead of the face onto the bangs, glue eyes together and onto the face, use pop up adhesives on the nose to attach to the face. 2) Attach patches to ribbon with glue separately. Glue one end of the ribbon to top of pirate ear and the other end above the bangs. Cover ribbon end by gluing scarf on top of head. Glue scarf with cut-out circles on top of solid scarf. 3) Attach gold earrings by punching small holes with needle and loop them through. 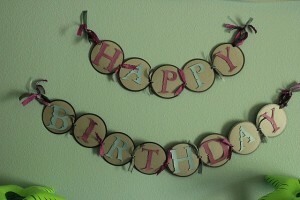 4) Information on the inside was set-up on Photoshop and cut on the Cricut by measuring carefully. After that, your pirate is complete. Savvy? I hope I didn’t confuse ye too badly. Just message me if ye have any questions and use the pictures for reference. Thanks for checking out me site! Enjoy making those pirates! Aarrrrrrrrrrgh….. Check out the fun photos from the party! The birthday girl, Pirate Novalee! 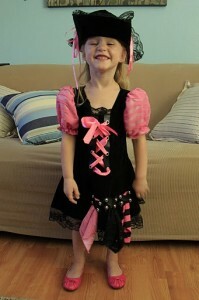 Isn’t she just the cutest 3 year old you have ever seen? Happy Birthday to my beautiful niece! Captain Brian and his wench, Taryn, with their two little pirates, Novalee and Kenley. Add a treasure chest full of jewelry your kids already have is a great touch! Make sure to display your desserts, especially if a lot of hard work was put into them and if they match your theme perfectly! 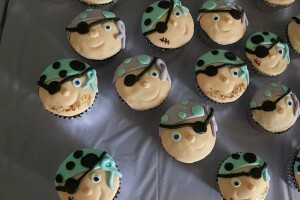 Yum yum cupcakes! 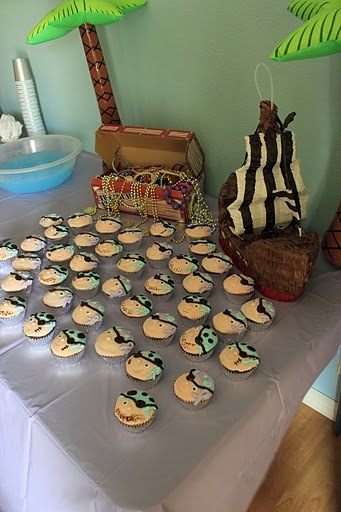 These delightful treats were made by my sister, Taryn, and our good friend, Sergio Morales. Tasty and adorable! 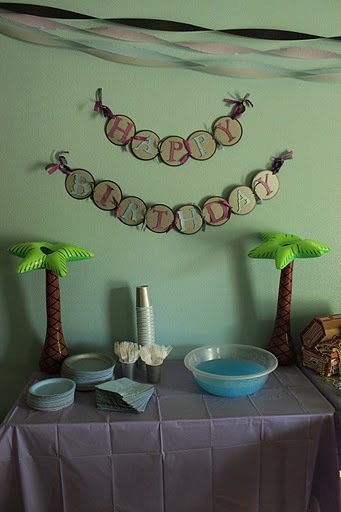 The birthday banner was made by…guess who… ME! It was made with love to match the party colors and pirate font to match the theme. 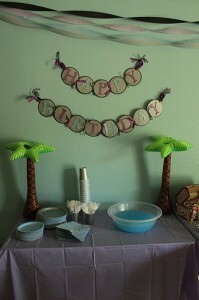 Feel free to contact me on how to make your own bday banner! The birthday girl and me! Hope you had a great day! then comes baby in a hot pink carriage. 1) Hot pink solid cardstock, black and white polka dot paper, white cardstock, transparent paper, & pearl adhesives. Don’t forget the basics: glue, trimmer, a Cricut, and my carriage .svg ! Just click below! I always try to give credit where credit is do. I buy my supplies at Michael’s and a local craft store called Treasured Mememories Scrapbooking Store. It’s always convenient to run to Michael’s but I highly suggest checking out Treasured Memories if you are in the area of Oak Park, CA area. Or visit their website to shop online: http://www.treasuredmemoriesca.com/. 1) Make folded hot pink papers to whatever size you desire. I usually trim a slightly smaller white card to go on the inside so people can write their notes in it. 2)Print the “Thank You” on transparent paper. I usually set it up on Photoshop and print on 4×6 pieces then trim to the size needed. Use spray adhesive to glue onto pink background. 3.) Cut polka dot paper to desired size and glue on transparent paper. Then cut white circle to glue on top of polka dot paper. 4.) Use the Cricut to cut out my Baby Carriage.svg, and use Pop-up adhesives to give it a cool effect. I also added pearl adhesives in the middle os the wheels to fancy it up! And there you have! This is a fun design that you can obviously play with and make your own with different colored and pattern paper. Add some bling or what not and you will have some pretty schnazy “thank you” note cards! Who knows.. maybe someday soon I will be making these for my own baby shower! Ya, right! Like I am going to make my own cards! Better yet, like I am going to have a kids soon! NEVER!!! You can’t make me mom and sis! You are currently browsing the Grealish Greetings blog archives for July, 2011.